For all of his love of sport, hunting, reading, writing, and politics, what Theodore Roosevelt enjoyed most were his six children. His youngest boy, Quentin, was the biggest handful: a “fine little bad boy” his mother called him, and his father, a "blessed rogue" on good days, and a "regular alley-cat," on bad. Quentin was the family favorite, all agreed, the son most like his father. With the advent of World War I, all four Roosevelt boys put on a uniform and, like their father in Cuba, charged into the fray. Quentin opted for the most adventurous military service, the new army air corps, and flew his first patrol on July 1, 1918, and his last, two weeks later. Shot down in a classic dogfight by an enemy ace with 24 kills to his credit, Quentin was buried by the Germans, with honors, near where his plane went down in Chamery, France. He was 20 years old. 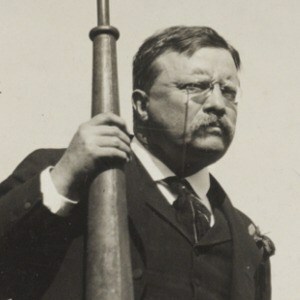 Theodore Roosevelt, broken-hearted, died six months later. Typed Letter Signed, with four lines in Autograph, 1 page, quarto, Oyster Bay, Long Island [New York], July 27, 1918. To Major Rock H. Channing, Jr. With transmittal envelope. I am very glad to get your letter. Well, I wish you and I were on the other side! It is hard for me [text is crossed out] because the old should not live when the young die. My four boys have done pretty well, haven't they?